We love our pups!!! !This is the 1st step in the adoption process!! 1. What is your personal reference or Vet’s Name and phone number? We check to make sure we do not sell to breeders. 2. What other pets are now or recently have been in your household? These pups will live for many years. We want them to become a happy, healthy part of your family. Therefore, your experience with other pets is important information. They will require time and energy for training and giving love and attention. 3. Is your residence in a rural, suburban, or metropolitan area? These pups are the perfect size for any type of lifestyle. 4. Is your yard enclosed? We will sell to experienced families who prefer to walk their pups. They can run very fast when they are older, training them to stay and come, is very important. 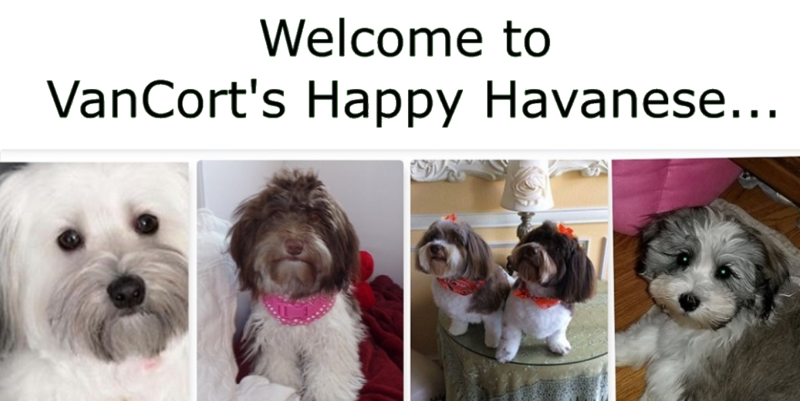 Electric fences do not protect your Havanese. 5. Who will be responsible for the care and feeding? 6. What are the ages of any children in the home? 7. Will the pup be alone for long period of time? 8. Will you crate train or pen the pup? 9. Which pup do you like? Color? Energy level? Male or Female? 10. Your name, address, phone and email address. So you think your ready? Here are some ideas to prepare for your baby. We use plastic puppy Exercise Pens. For the pups during the day for naps or when left alone. We put puppy pad at one end and their blanket or bed at the other. Try Petedge or Babies R US. We feed Nutrisource Small and Medium Breed Puppy, Iams Smart Puppy or Blue Buffalo Chicken and Rice puppy food. We leave the food down all the time here for the pups, but to better potty train it is a good idea to let the puppy eat, then take him out right away. Put the food up, leave water in their pen. Feed three times a day at first, then reduce to twice per day. They chew on the flat rawhides, throw them out when they are too small. We have little stuffed toys, they chew on and rest their heads. We use fabric puppy pads(washable), they are on EBAY, search whelping pads. Or paper pads can be purchased at pet stores. Some of our families have been very successful with litter training.